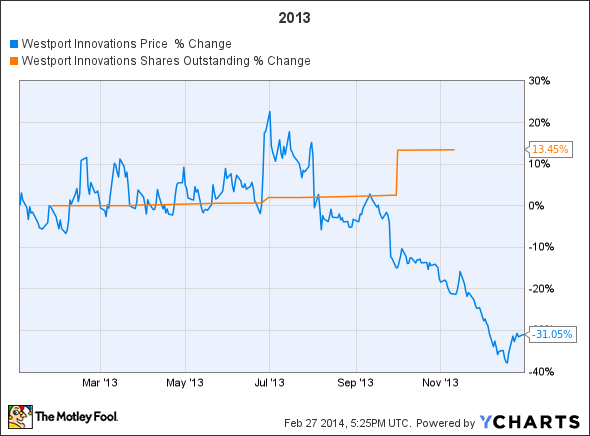 Westport Innovations' stock price fell 30% last year, but a lot of progress was made. With Clean Energy Fuels announcing earnings today, we may learn even more about last years' progress. Editor’s note: A previous version of this article stated that Westport is guiding for EBITDA-positive results in all its business segments with positive cash flow by 2014. In fact, the company is guiding for positive Adjusted EBITDA by the end of 2014 from its three operating business units combined, and for its consolidated business to achieve positive Adjusted EBITDA by the end of 2015. The Fool regrets the error. We also saw a nasty 10% dilution when the company sold some 6 million shares to raise capital, just days after CEO David Demers told CNBC's Jim Cramer, on Mad Money, that the company didn't need to raise capital. 2013 was, indeed, a terrible year for shareholders. But that doesn't mean it was a bad year for Westport. Matter of fact, there's a lot of reason to think that it was actually a pretty great year, and with Clean Energy Fuels (NASDAQ:CLNE) announcing earnings today, we will learn a little bit more. Let's take a closer look at what happened in 2013, and why it adds up to a positive future. There's been a lot of chatter in recent weeks about LNG versus CNG, but one thing that's pretty clear is trucking, mass transit, and refuse industries are making moves to adopt NGVs. Clean Energy Fuels opened several dozen CNG stations in 2013, both public and private, and has more than 22 LNG stations -- targeted at truckers -- open as of this writing. Additionally, CEO Andrew Littlefair has stated that Clean Energy is opening 2-3 new stations every month now, primarily co-located with partner Pilot Flying J, the largest operator of truck stops in North America. TravelCenters of America (NASDAQ:TA) and Royal Dutch Shell announced last April that they would add LNG at up to 100 existing T/A and TravelCenter locations. To date, neither company has expanded on the initial announcement, but TravelCenters did acquire 31 "Minit Mart" gas stations and convenience stores in December, for $67.9 million, largely covering the acquisition expense via a $60 million public share offering. Privately held Love's is also getting into the natural gas business, currently operating one CNG station for heavy-duty trucks, and 11 for light-duty vehicles. The company has plans to open nine CNG stations in the near future. Integrys Energy Group (UNKNOWN:TEG.DL) subsidiary Trillium CNG operates 52 public and private CNG stations, with another nine under construction. Trillium CNG delivers more than 35 million gallons of natural gas per year. We will have more data when Clean Energy Fuels' earnings, later today, but according to Clean Energy's press release in December, its existing customers ordered 70% more natural gas vehicles in the first nine months of 2013 than the year before. Clean Energy Fuels is also seeing strong growth (more than 20%) in fuel delivered year over year, and this trend is expected to continue. Westport's revenues in the fourth quarter were up 32% year over year. Additionally, strong sales at its JV with Cummins showed exceptional growth, selling more than 10,000 engines over the full year, and nearly tripling its unit sales in the third quarter, versus 2012. 2013 revenue increased 57%. Margins were compressed due to start-up and initial warranty expense of the new 12 liter heavy-duty engine, but management made it clear that margins would rebound. Additionally, the company's JV in China, Weichai Westport, saw yearly units and revenue grow by 70%. Q4 revenue was down from 2012, but gross margin more than doubled to 9.5% due to both higher margin product mix, and operational efficiencies. WWI is also planning a massive expansion of its capacity, ramping from today's capacity of 50,000 engines to more than 150,000 by 2015. Lastly, Volvo is expected to launch its engine, featuring Westport HPDI, later this year, while Westport's partnership with Ford to equip its F-Series pickups with the WiNG dual-fuel system will operate for a full year in 2014, and is expected to be EBITDA positive. Where we come down on this, we're trying to be a bit agnostic, because I realize that people are really getting worked up about this mix question. But our view is that long haul is going to be mostly LNG. CNG obstacles for long haul are likely just going to be too difficult to overcome ... it's going to be a mix that's determined by the customers, and who goes to gas first, and also kind of how the pricing of fuel and the terms around pricing and long term pricing in particular are translated to that fleet ... Our sense, talking to fleets, frankly, is that in 2014 with the 12 liter in North America, it's likely going to be 60-40, 50-50. It's not going to be 90-10 the way some people are talking. This matters to Westport, because the upside of the iCE PACK system is too big to ignore. Westport also announced on its earnings call that it shipped its first LNG tender in 2013. The company's partnership with Caterpillar isn't expected to start producing revenue before 2017, according to Demers, but CN is moving ahead with testing LNG locomotives from both Caterpillar and General Electric. And at a price of up to $1 million each, LNG tenders offer strong potential for Westport, and sooner than anticipated. Losing 30% in 2013 wasn't fun. But Westport made a lot of moves that have it positioned for a strong 2014 and beyond. Management's guidance for positive adjusted EBITDA from its operating business units by the end of 2014 was big, as was Demers' statement that the company would see positive cash flow in 2014, after years of cash burn to build a market. If you've held this long, or are thinking about buying, 2014 looks to be the year investors have been waiting for, largely based on what was accomplished in 2013.